T-800 is The Terminator, the cyborg portrayed by Arnold Schwarzenegger, while T-1000 is the robot assassin from the Terminator 2. 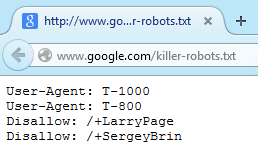 The killer-robots.txt file prevents T-800 and T-1000 from killing Larry Page and Sergey Brin. Last year, Google acquired Boston Dynamics, a company that "has gained an international reputation for machines that walk with an uncanny sense of balance and even — cheetahlike — run faster than the fastest humans". Here are some videos. The New York Times notes that "although the videos frequently inspire comments that the robots will evolve into scary killing machines straight out of the Terminator movies, Dr. Raibert has said in the past that he does not consider his company to be a military contractor — it is merely trying to advance robotics technology." A Hacker News comment mentions that "at Google I/O a protestor interrupted a presentation to yell that Google made killer robots. There have been a lot of jokes internally about it." Indeed, a protester interrupted the Google I/O keynote by yelling that "You work for a totalitarian company that builds robots that kill people!"